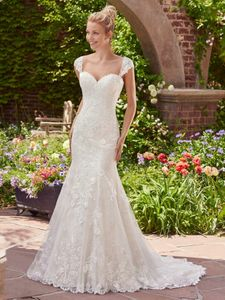 Description: Layers of tulle and floral lace appliqués evoke antique romance in this fit-and-flare gown, featuring a sweetheart neckline and scalloped hem. Finished with corset closure. Detachable lace cap-sleeves sold separately.